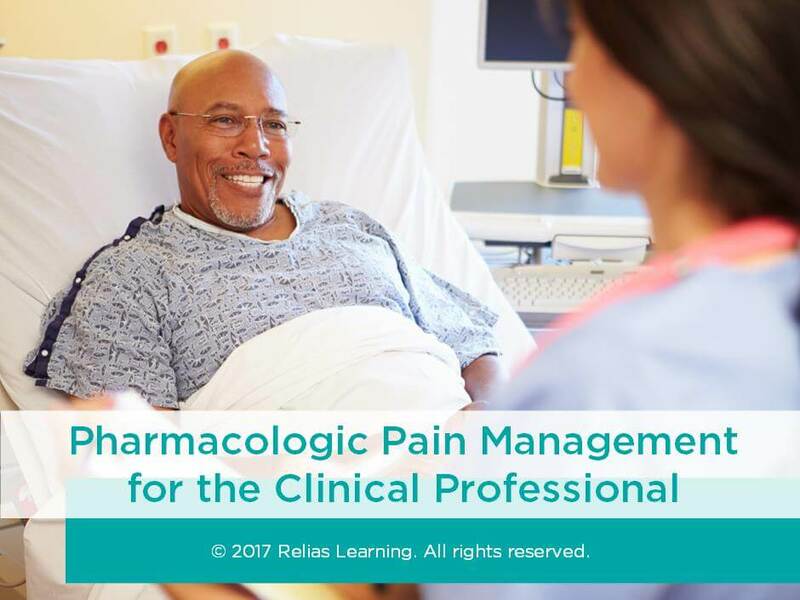 In this webinar with pain expert Pamela Davies MS, APRN, ACHPN, RN-BC, you will learn in depth information about pain management. Among the topics covered are analgesics, opioids, non-opioid pain treatment, as well as the topic of opioid overdose and its treatment. You will discover the unique characteristics of pain management in older adults and for those with chronic pain. By comparing two different individuals, you will explore how the meaning of pain affects the perception of pain. You will practice dosing for those who are opiate tolerant versus opiate naïve in several examples. This webinar will enhance your knowledge of pain medications so that you can apply it to many care settings. Describe 2 physiological changes that impact the analgesic drug and dose selection for an older adult experiencing pain. State a unique feature of methadone that impacts its safety when used for pain management. Describe the management of an acute pain crisis in advanced cancer. State 2 factors that increase the likelihood of an accidental overdose of prescribed opioids. State 2 opioid side effects that improve over time, and one that does not improve over time. State 2 classes of drugs that are useful for managing neuropathic pain. Pamela Stitzlein Davies is a highly experienced clinical and academic Nurse Practitioner in the fields of Pain Management, Hospice & Palliative Care, Internal Medicine, and Geriatrics. She was a member of the American Pain Society/American Academy of Pain Medicine guidelines committee for Chronic Opioid Therapy in Chronic Noncancer Pain; and the 2015 and 2010 Washington State Interagency Guideline on Prescribing Opioids for Pain. Ms. Davies is a popular national and regional speaker on topics in pain management and palliative care. She has authored multiple publications, including an award-winning text on cancer pain management for nurses. Areas of expertise include: best practices related to prescribing opioids and other Controlled Substances in the outpatient setting, opioid misuse in the primary care, palliative care or hospice setting, and chronic pain management in the cancer survivor. Disclosure: Pamela Stitzlein Davies, MS, ARNP, A/GNP-C, ACHPN, RN-BC has declared that no conflict of interest, Relevant Financial Relationship or Relevant Non-Financial Relationship exists. The target audience for this course is: entry and intermediate level Physicians; entry, intermediate, and advanced level Nurses; in the following settings: Hospice, Palliative Care.